You'd think that fast-food restaurants -- with their emphasis on value -- would appeal primarily to those at the lower end of the income scale. But according to a new national study, dining at McDonald's (MCD) and its quick-serving competitors becomes more common as people make more money. The study, published by the UC-Davis Center for Healthcare Policy and Research, was conducted by two specialists in health economics, using food consumption data from a nationally representative sample of 5,000 people. The authors found that visits to fast food restaurants increased as annual household income rose -- up to $60,000, at which point they started to decline. "There is a correlation between obesity and lower income," concludes senior author J. Paul Leigh, professor of public health sciences at UC Davis, "but it cannot be solely attributed to restaurant choice." 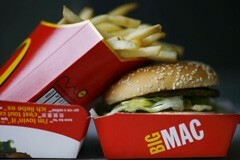 In fact, says Leigh, fast food is most popular with the middle class, and they're less likely to be obese. Leigh observes that fast food chains work consciously to attract middle-income customers: "Low prices, convenience and free toys target the middle class -- especially budget-conscious, hurried parents -- very well." Obesity among the poor, Leigh told the LA Times, is more a result of "the relatively cheap price of junk food items found in supermarkets, convenience stores and mom-and-pop markets in impoverished neighborhoods." The nation's poorest cannot afford regular visits to fast food restaurants, the newspaper notes, "especially those who need food stamps to get by." In fact, the price of fast food is set to rise, following cost increases that have cut profit margins at large restaurant chains this year. McDonald's, which already hiked prices 2.5% between March and May, announced last month that it would increase the prices of selected menu items in response to rising commodity costs. Other companies expected to make similar moves include YUM! Brands (YUM) -- parent of KFC, Pizza Hut and Taco Bell -- and Wendy's (WEN). According to the International Business Times, Peter Bensen, chief financial officer of McDonald's, said that "the atmosphere was right because previous rounds of pricing changes had not dissuaded clients," a claim that supports the UC Davis study's conclusion that fast food chains' clientele are not, by and large, the truly poor. A press release announcing the study's results admits that it "was limited by the fact that the data came from the mid-1990s, the most recent information available on the subject." But Leigh said he believes "that the eating-out patterns found in this study would still hold if more up-to-date data were available," despite changes in incomes during the intervening years.